← Have You Tried: Making Pierogi? A couple of years ago I discovered the phenomena of dying Easter eggs with natural dyes: food, flowers, or spices. In honor of the bounty that flows freely from our coop every day – this seemed like a golden opportunity to experiment with using food items to change the color of our eggs. The process is very easy. Take several eggs, cover them with water, add a teaspoon of white vinegar and add whatever colorant you want (turmeric, beets, black cherry juice, spinach, blueberries, chamomile tea, cranberries, red wine, etc. ), bring the liquid to a boil and let the eggs cook gently for 10 minutes or so. If a stronger color is desired, then remove the eggs, strain the particles from the liquid and put the eggs back into the pot in the refrigerator overnight. It sounded very reasonable. Yet once I started doing the deed, I experienced a series of both mental and practical hurdles. 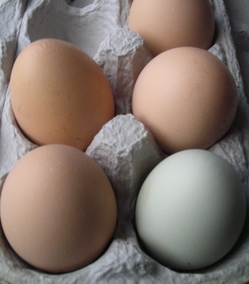 Hurdle #1 – Our chickens lay green, blue and brown eggs and I refused on principal to go out and purchase white eggs. Hurdle #2 – I wanted to experiment with blueberry juice, cranberry juice, carrot juice, chlorophyll and black cherry juice yet our stove has only four burners. Hurdle #3 – I couldn’t help but wonder as I juiced the carrots down why I was using perfectly edible and delicious food to make dye for eggs. I opened up the freezer and poured out bouncy blueberries and cranberries lovingly harvested and frozen from my Locavorious CSA. I used almost a cup of black cherry juice. I checked the color of the lightest brown eggs in the carrot juice – “Is that a change? Is it just the light? Are they any different?” – and wondered, why eggs? When I was growing up, we would dye eggs using the little pellets in the bowls on the counter. On Easter morning my father, a.k.a. the Easter Bunny, would hide them in the back garden for us to find, and then we would head out for brunch at a fancy hotel in honor of my grandmother’s birthday. Then we would head to the Tidal Basin and admire the cherry blossoms in bloom. For the next week we would eat eggs for breakfast and have egg bumper car-esque competitions between the four of us to crack the shells. The egg is a symbol of rebirth, and thus is a good stand in for the story of Jesus Christ’s Resurrection. In Passover, the egg represents the ritual sacrifice at the Temple of Jerusalem. In the pre-Christian world the egg was a fertile symbol of the coming Spring and life about to burst forth from the warming earth. Next year I am going to sidestep such hurdles. I will use food safe pens and draw on my already colorful eggs. I will use the stickers languishing in my wrapping paper box. I will celebrate the season without ending up with a collection of earth colored eggs. This entry was posted in In the Kitchen (recipes & more) and tagged Backyard chickens, chickens, Corinna Borden, Easter Eggs, natural easter egg dyes. Bookmark the permalink. Can you still eat these eggs then?? since it is natural coloring? 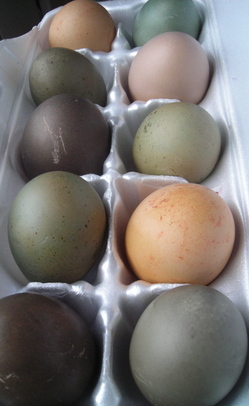 You can certainly eat these eggs – I found that the natural dyes did not stain the inside of the eggs at all.